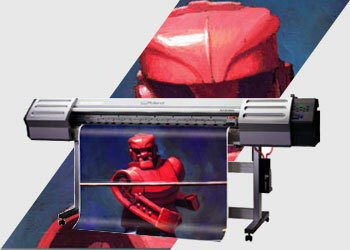 Eco-Sol® MAX is a remarkable innovation in ink technology. Building on Roland's award-winning eco-solvent ink, high-density Eco-Sol MAX dries fast and offers a wide color gamut, rugged scratch resistance, broad support for uncoated and coated media, and three years of outdoor durability – all at a low cost per square foot. Eco-Sol MAX also offers the peace of mind of GREENGUARD Certification. It's virtually odorless and does not require any special ventilation or environmental equipment. Two formulations are available, each optimized for your printer hardware. Available in 8 Colors, Cyan, Magenta, Yellow, Black, Light Cyan, Light Magenta, White & Metallic Silver. Winner of numerous industry awards, original Eco-Sol MAX remains the world's most popular eco-solvent ink. Formulated specifically for SOLJET PRO III, VersaArt, VersaCAMM VS, VersaCAMN SP and VersaStudio BN-20 inkjets. Eco-Sol MAX boosts the performance of Roland’s SolJET, VersaArt, VersaCAMM and VersaStudio inkjets to provide lower running costs both you and your customers will appreciate. Winner of numerous industry awards, original Eco-Sol MAX remains the world's most popular eco-solvent ink. Formulated specifically for VersaArt, VersaCAMM VS, VersaCAMM SP-i and VersaStudio BN-20 inkjets. Eco-Sol MAX 2 produces even richer, more consistent colors and ensures both the smoothest gradations and sharpest photographic details.